Coe Press Equipment, Sterling Heights, MI, will display a conventional coil line featuring its ServoMaster SM2-18 zig-zag roll feed that allows parts to be fed in a staggered pattern for optimum material usage. Roll speed peaks at 576 ft./min., with a 0.003-in. feed accuracy. 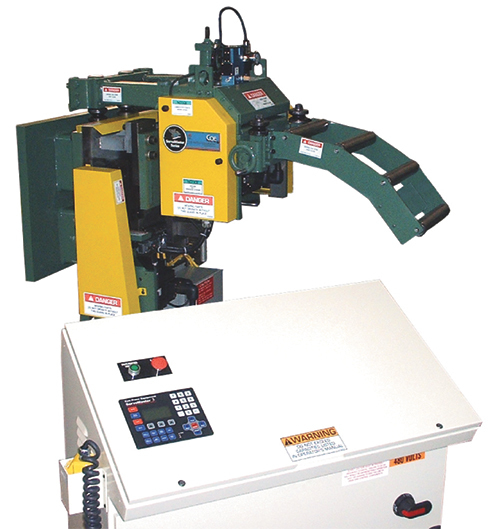 Included in the line is a CPPS-250-18 power straightener with a 60-ft./min. payoff rate, and a CPR-DE-6078 double-ended coil reel. The line can handle coil width to 18 in., and can process 12-in.-wide steel to 0.125 in. thick and 18-in.-wide strip to 0.100 in. Coil weight capability: 6000 lb.